Anyway, Hello and welcome again to all readers!! After quite a long time not posting to this blog, I finally have the time to write. As I had mentioned before in my post, I had an examination to go through and now I’m free plus, I will have a holidays for about 3 month!! Yeayy!! But most probably I will have to do a part time while waiting for a new semester to start, so before I start to get busy with the work, I shall publish some of interesting food spot I had go before. The front view of the restaurant at One Utama, Damansara branch. First, because it is a buffet All-You-Can-Eat restaurant. There are so many of choices here. At first, I don’t know where to start. Second, it’s a Cook-It-Yourself BBQ restaurant. So they only serve raw food then you need to cooked it. I’ll show you the picture below. To me this is quite unique because we rarely see this style of restaurant around. My Verdict on this restaurant. Food: Nice~ I love the variety of it. Environment: Very Comfortable and I like the uniqueness on how we need to grill the food by our self. The style is copied from the Korean BBQ stall. Price: To me, for a buffet with such amount of variety of foods, it is very reasonable. The price for us 2 person, is MYR 87.70. Divide by 2, it’s MYR 43.85 per person. Remind you this is a dinner set, it is more expensive than lunch. And the price is plus the free flow drinks also. For students, the price is different depends on what day you come. If you come on weekdays, the price is cheaper. 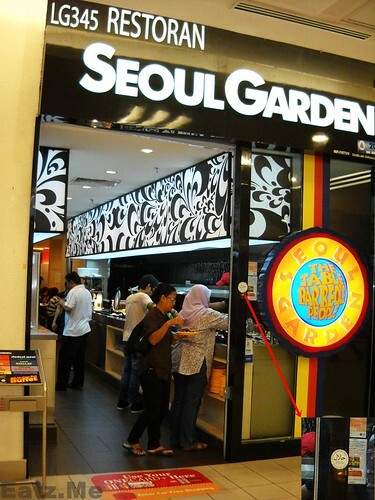 From the price signboard, for lunch you may get MYR 22.88 and for dinner MYR 28.88. Just to remind you this price is not including tax and free flow drinks. You need to add MYR 3.99 for free flow or refillable drinks. Sunday – Thursday: Lunch is from 11.30am till 3.59pm. Dinner is from 4.00 pm till 10.00pm. Friday – Saturday: Lunch is from 11.30am till 3.59pm. Dinner is from 4.00 pm till 10.30pm. 1) Klang Valley: 1 Utama Shopping Centre (The one I go for this review), Plaza Pantai, IOI Mall. 4) Johor Bahru: City Square, KSL city. * All are Halal certified except for Auto city branch where the certification is still in process.